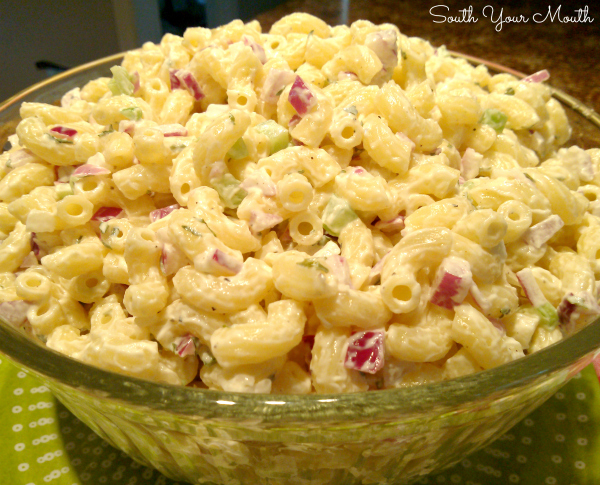 A cool and creamy macaroni salad recipe with red onions, celery, mayo and a ton of flavor. A few weeks ago my mom spooned a pile of this into a cool whip container and gave it me to take home. I glanced at it and thought, meh. It sat in the fridge untouched a few days because I… well… I just thought it would be… meh. It just looked like every other macaroni and mayonnaise salad, which, in my experience, has never been anything to get excited about. I brought it to work with me to eat for lunch but really couldn't muster any enthusiasm to eat it. When my stomach started munching on my backbone I finally grabbed it and decided to eat some. Oh. My. Blog. It was so good! I just assumed it was pasta, mayo and a few minced veggies so I was blown away at the flavor! Like, truly shocked!!! I called mom to ask what in the world was in it and she faxed me the recipe she’s had tucked away in her cookbook from Cook’s Country magazine. I think they’re a little persnickety about sharing their recipes so I don’t want to give anything of theirs away. Below is my version of their recipe. I made a few changes but I do want to point out that this was totally inspired by their very inspiring recipe for Cool and Creamy Pasta Salad. If you enjoy salads like this, you might enjoy these recipes too! Mediterranean Lentil Salad - Lentil salad with an easy homemade Mediterranean inspired vinaigrette (or use prepared) and fresh, crisp vegetables. Cucumber & Tomato Salad with a Simple Summer Vinaigrette - A salad made with cucumbers, tomatoes, onions and an easy oil and vinegar dressing. Crunchy Oriental Ramen Salad - A crunchy Oriental salad recipe using coleslaw mix and ramen noodles! This retro Asian-inspired salad is always a hit! 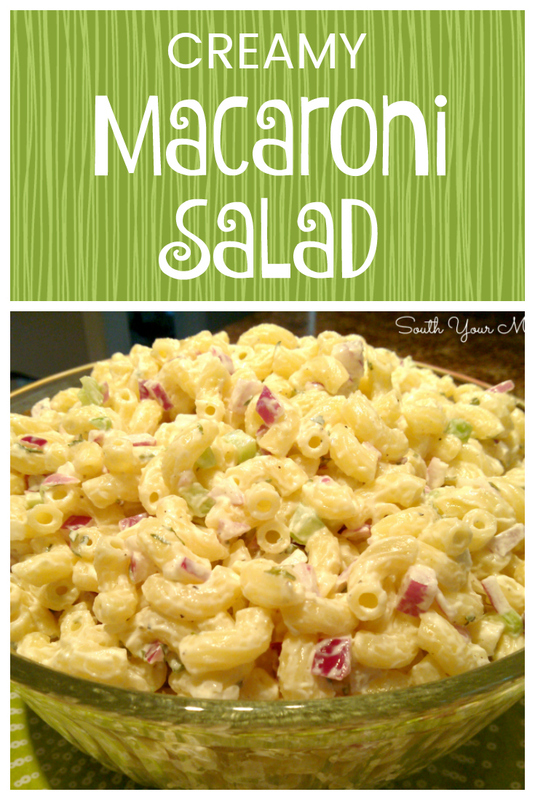 Creamy Macaroni Salad - A cool and creamy macaroni salad recipe with red onions, celery, mayo and a ton of flavor. Picnic Pasta Salad - Classic pasta salad recipe made with Italian dressing, cucumbers and tomatoes. Creamy Cucumber Salad - A German recipe for cool and creamy cucumber salad made with sour cream, a little vinegar and a pinch of sugar. Cook pasta in liberally salted water per manufacturer’s instructions for al dente preparation. Drain pasta then rinse in cold water. Drain again then immediately add pasta to a large mixing bowl. Don’t let it set and dry out, you want the pasta to still be on the moist side for the next step. Add parsley, garlic, salt, pepper and Dijon mustard to pasta and stir until well combined. Let pasta “marinate” in the seasonings for 15-20 minutes uncovered at room temperature. Doing this allows the pasta to soak up the flavors of the parsley, seasonings and mustard before adding the mayonnaise. Whip together mayonnaise and vinegar then set aside. Add onion, celery and mayonnaise mixture to pasta and stir until all ingredients are thoroughly combined. Cover and refrigerate 1-4 hours before serving. Before serving, mix well then add more salt to taste or mayo if desired. *Use any small, tubular, ridged pasta for this recipe. I think ridged pasta is best for pasta salads because the ridges help the other ingredients stick to the pasta. Yummy! I use whole grain pasta because I have diabetes, but do everything else the same minus garlic. It's so good! How many carbs would be in the whole grain pasta then? We used gluten free macaroni the last time and the family loved it.. My 10yr old great grandson requested it for his birthday day party..I thought the gluten free macaroni was a little grainy but no one else seemed to notice.. Try adding cherry tomatos cut in half. Ans the pasta that looks like tulips. Its a rooled pasta. Looks pretty and holds little bits of mayo goodness in every bite. I thought this would be a new wonderful mac salad recipe but was pleasantly surprised that this is the one I already make I also add parmesan chz and red and green peppers but true true it is delicious!!! I also add chopped hard boiled eggs. I make mine the same way but substituted the vinegar for dill pickle juice. Wonderful. Awesome recipe! For all you low carbers out there - check out DREAMFIELDS HEALTHY CARB LIVING PASTA - 5 carbs and tastes amazing. My hubby won't eat carbs but will eat this thank Goodness! My Mom always added a small amount of French Dressing to give it some zip. We did not add mustard. Personal taste. This and all your recipes read like they will be wonderful. I Love your website! Just visited cause of a Pin.. I have sat here for hours reading your recipes and comments. God Bless you for purveyin' to your readers True Southern recipes and for understanding that this world class cuisine requires some individualization! I admit prejudice, being a Tennessean who lives in Florida: but Southern cooking must be the finest food in the world! I made this when my husband and daughter were away - thinking it wouldn't make that much. It made a smidge more than I expected, however, it was still gone in three days. Absolutely amazing!! I cut the recipe in half for my house. If I want to go lower-carb, instead of pasta, I use twice as much celery and a cup or so of green peas. Or for really low carb, instead of peas, I add cooked and diced chicken. We love it. Could you please give me the approximate cup amount for the red onion?? I guess about 2 cups? Pinning to try because it sounds so good!! I made this today for Father's Day dinner. I did not use mustard but added fresh chives and fresh parsley from my garden as well as split cherry tomatoes and crisped crumbed bacon. OMG. It was incredible. There are so many variations to this recipe....excited to try it with hard boiled eggs and grilled chicken next time to serve as a main coarse. This pasta salad is the bomb! I make it for every family gathering and everyone asks for the recipe.